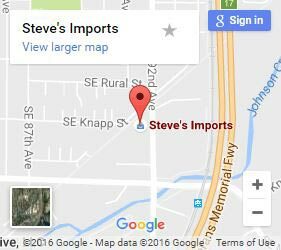 Steve’s Imports is an auto repair shop that’s been performing Mercedes-Benz service for residents of Clackamas, Oregon for four decades. Our service has tracked the evolution of the original 190s, 5 generations of C-Class, E-Class and everything in between. Our ASE-Certified technicians are factory trained technicians and have direct experience with every type of Mercedes Benz around. More than just their prestige, Mercedes are very reliable vehicles. It is not uncommon for us to see a 1980’s Mercedes 300D with nearly half a million miles on it – with regular service maintenance they can last a lifetime on the road. Mercedes-Benz are known for an uncompromising performance that endures. Let Steve's Imports get the most out of your vehicle. With over 40 years working on Mercedes-Benz, pur ASE Certified technicians know how to keep these keep your Mercedes living up to its reputation. 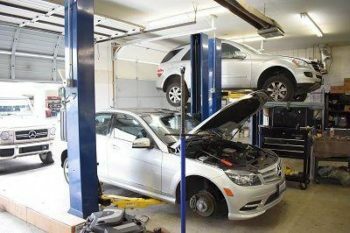 Experiencing One of These Common Mercedes Engine Problems? Crankshaft position sensors are a common failure on early and late model Mercedes. It is a failure common to many vehicles however it is prevalent in Mercedes. The failure is first noticed by a random no-start issue, which is quite frustrating, especially when left stranded. From there, the problem can come and will eventually get worse causing more frequent no-start issues. Over-heating can be a primary factor in a failing Crank/Cam position sensor. Timing chain failure, or timing chain tensioner failure can be catastrophic if not taken care of immediately. Mercedes engines are what we call “interference” motors. Which means if the timing becomes too far off then the engine components (such as the valves and pistons) can impact, causing your engine to internally detonate. Timing failures can often be the result of a stretched timing chain, chain tensioners, as well as the camshaft adjusters and chain tensioners. Mercedes commonly uses plastic valve covers on later models, which is very common for most automakers nowadays. The only issue is that we commonly see leaks from the valve cover gaskets. It is important to have these leaks carefully repaired and set to proper torque specs when replacing the valve cover and/or gasket to avoid warping the plastic valve covers causing the leaks to become even worse. Checking your engine oil level on a Mercedes is quite different than most cars. Mercedes comes equipped with an engine oil level sensor so that you can check your oil without even getting out of your car! The downside? These sensors are known to fail, which can cause your engine oil level to read faulty. Make sure you have this issue diagnosed and repaired so that you don’t run your Mercedes low on oil! This leak is found on the base crankcase, where you insert the oil filter cartridge. The oil filter housing bolts to the engine crankcase and is joined with a gasket. Unfortunately, that can cause a leak onto your engine. Make sure and have it checked during each oil change. Mercedes has been using turbos for decades, but they are becoming increasingly popular in the later gas vehicles such as the Mercedes E-Class, C-Class, and S-Class. Turbo vehicles are an incredible source of added power however they can fail. If your Mercedes has excessive smoke coming from the exhaust or is making hi-pitched “whirring” sounds when accelerating, be sure to get your car in to a mechanic to have your Turbo checked. These two components have bearings in them that commonly wear out. This can be identified by a rattling noise when you first start your car, and can sometimes quiet down after the car has been running for a short while. When the drive belt idler or tensioner fails completely, your vehicle will become undrivable. It is also important to confirm failure of they pulley due to similar symptoms that may be caused by the water pump pulley. A water pump pulley failure can be catastrophic. ABC (Active body control) failure is often caused by hydraulic system failure due to a malfunctioning tandem pump, leaking hard lines or strut assemblies. Excessive low ride height due to pneumatic failure, often caused by leaking air springs. This can be caused by a minor air leak that causes air to escape faster than the compressor can pump up the suspension to life the car. This can also cause the pump to wear out prematurely. Automatic trunk assist failure is something we have seen fairly common. Predominate in the Mercedes GLS and other SUV models but also an issue found on the E-Class and S-Class models. This can be caused by failed sensors, as well as the trunk control module. There are many components that operate the opening and closing of the trunk and several different parts can be the culprit. It is important to diagnose the issue properly using a Mercedes diagnostic computer that can access this module. Even more common in late 90’s and early 2000 models, Mercedes did not have the best wiring harness’ and there was a common issue of “wicking” moisture whether it be oil from an oil leak, ambient moisture or whatever else made it’s way to a harness end or sensor plug. The moisture would then be wicked into the sensor or module causing a circuit failure. Common symptoms can be transmission failure, Check Engine Light, or body control failures. 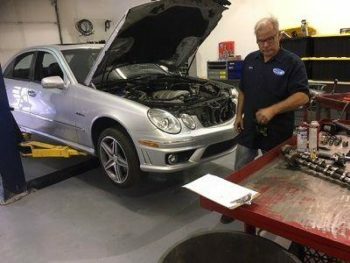 It is important to have your mechanic check for oil leaks and thoroughly clean your engine bay to confirm that your Mercedes will not be a victim of this common electrical issue. Flex disc, also known as the drive shaft coupler, can fail and cause a very annoying vibration in your Mercedes. That is more commonly felt at highway speeds. This issue is more commonly found in Mercedes GL-Class and ML-Class SUV’s. It is important to take care of so that the excessive vibration does not cause damage to the differential or suspension troubles down the road. Steve was working in the shop with his 14-year-old son John when the phone rang. Steve and his son jumped in the car and headed over. Greeted at the front door by a sweet elderly lady, they were shown to the garage. 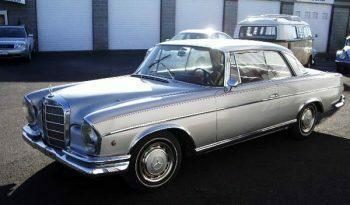 To Steve’s surprise, the car was a dust-covered 1959 Mercedes 190SL—a car that most Mercedes enthusiasts would be happy to see, let alone get the opportunity to work on. We wrote an estimate, took the car into the shop, and restored to her a beautiful Blue 190sl. She told me that was the car her late husband drove when they went on their first date. She then paid me, accepted the keys, and handed them right to her son.